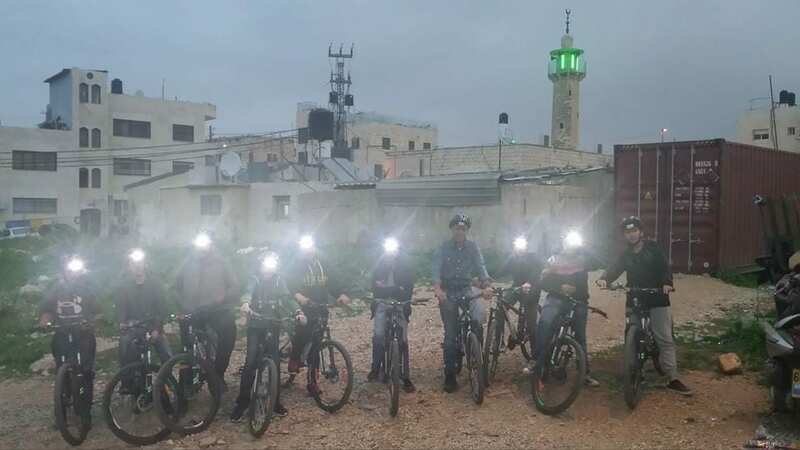 Arava alumnus, Ghaleb Mashni, has created the Cycling Forward Club, a youth bicycle program in his community in Shu’afat in east Jerusalem that has made bicycles accessible to Palestinian youth who would otherwise not be riding bikes. Arava Institute Executive Director David Lehrer introduced me to Ghaleb on the night before the 2015 Israel Ride, because I too coordinate a youth bike program in Boston, Massachusetts. Last Saturday I joined some of the Club’s activities.I arrived in the afternoon on a field with a large container, Ghaleb and perhaps 20 children, ages 7-12, buzzing around him and getting fitted with bikes and helmets. A few minutes later, I was on a mountain bike and following a lot of happy boys and girls as we rode through fields, up and down streets and around the neighborhood. The mood was palpable: kids on bikes, supporting each other, laughing, exercising and getting around their neighborhood carbon free. After a 45 minute ride, we returned to the lot with the container, and one of the older children, clipboard in hand, checked off bikes as they were re-hung on hooks in the locked container. I looked around and saw a lot of happy faces. There is a simplicity to the bicycle and the sense of independence, skill and fitness that it inspires. It is here in Shu’afat. After the younger children went home, 9 teenagers showed up for a evening ride. On this night, we would ride from Shu’afat up Mount Scopus, down into a busy neighborhood and over to the Mount of Olives. To do this, Ghaleb brought head lights and blinkers so that we could safely ride on the streets in the dark. From the Mount of Olives, we had a magnificent view of the Old City of Jerusalem. Along the way, people in the neighborhoods and at Hebrew University stopped and looked, and cheered, as the 11 of us, with lights mounted on our helmets and on the seat stays of our mountain bikes rode along like fireflies in the night. A group of tourists from the Netherlands stopped us by the Mount of Olives to find out what we were doing. They were amazed to see us riding with helmets, lights, and on mountain bikes. Tired, hungry but very happy, we pedaled through Shu’afat, back to the container … and I said “thank you” before heading back to Tel Aviv. Ghaleb has created an impressive program worthy of our support and admiration. I feel lucky that David encouraged us to work together and I look forward to support the program and riding with these kids again.